While there are many perks to living in the here and now (iPhones! Nicer toilets! A place in the job market! ), looking back to the past can be very good fun. 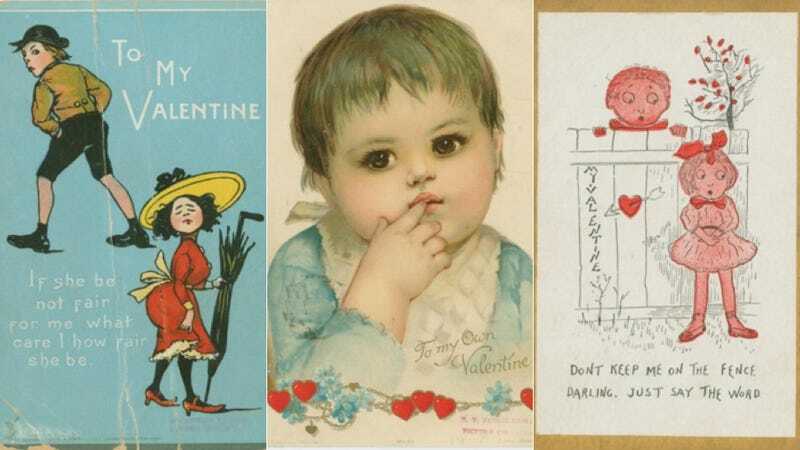 Which is why this February 14th, you should spend some time exploring the New York Public Library’s collection of archived Valentines. Valentines for the woman you might not love forever. Or, alternately, the woman who is deeply in love with a doll. A Valentine for the artist who wants this chubby, porny Cupid in their life. And best of all, a lot of them already come with inscriptions, so you don’t even have to be creative. Thank you and Happy Valentine’s Day to the New York Public Library’s digital archive (yet another reason to love living in the here and now).